Kisumu in western Kenya is situated on the shores of Lake Victoria, Africa’s largest and the world’s second largest freshwater lake. It has a population of around 400,000 and is the third largest city in Kenya as well as the principal city of western Kenya. Kisumu is one of the fastest growing cities in Kenya. Kisumu draws its name from the local dialect “Kisuma” which means a place of barter trade. Kisumu is a port city in western Kenya at 1,131 m (3,711 ft). The port was founded in 1901 as the main inland terminal of the Uganda Railway and named Port Florence. Situated on the tip of Winam gulf on Lake Victoria, it is the most important city after Kampala within the great lakes region. Environmental degradation and poverty are some of the challenges Kisumu share with other cities that have a rapid urbanization. Despite a growing economy, Kisumu still registers one of the highest poverty levels in Kenya. The infrastructure development and service expansion has not matched the rapid population growth, thus providing a great challenge to the city authority. Some of the most significant challenges besides transportation is the political situation, migration, planning and waste. Collapse of the East African Community led to reduced economic activities leading to derelict infrastructure especially of the railway network. The rail network not only acted as a means of transport but contributed immensely to the economic wellbeing of the city. However, effort is being made by the partner countries to revive the economic regional block. Kisumu is the bedrock of opposition politics in Kenya. Every political and electoral circle often leads to massive destruction of property and loss of lives. Consequently, this has led to investors’ fear of investment in Kisumu leading to high rate of unemployment. Rural urban migration has been a major contributing factor to population explosion in Kisumu and this has been exacerbated by devolved system of governance where youthful population flock the city in search of employment opportunities. High rate of productive but unutilized labor force from the youth in the city has therefore led to morality degradation and insecurity. Kisumu is facing stiff competition for investors with other towns within the country. Such competition has been brought about by devolved governance structure. Bedeviling the city is poor planning of infrastructural development and slower development of infrastructure that is not commensurate with population growth. Such has led to flush floods of the estate and city streets during rainstorms. Kisumu also developed as a port city at the shores of Lake Victoria yet the growth and development of the city has turned its back to the immense potential of the lake front. Kisumu as a growing city has not been able to cope with the massive solid waste handling issues. Walking along the streets it is a common sight to meet litter strewed on the pavements and the streets. Discharges from the small industries and liquid refuse from the hospitality industry and households within the city occasionally finds its way into the lake leading to eutrophication-a major contributing factor to the survival of water hyacinth. 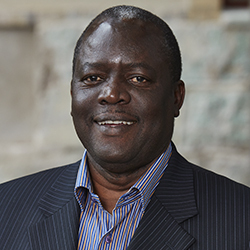 Professor Stephen Agong is the Director of the Kisumu Local Interaction Platform.